I have a bit of a challenge on my plate. Somehow I convinced myself to enter the pie contest at work. Never mind that I’ve never baked a pie in my life. Or that I’m frightened by the thought of making my own crust. And, as if one entry weren’t enough of a challenge, I registered to compete with two pies. What’s a girl to do? Cash prizes are up for grabs. Between now and Jan. 8 I need to develop some skills or else my coworkers will laugh at me after spitting out my weak excuse for a dessert. I welcome any and all pie-related advice. If you’ve got a tried-and-true recipe you’re willing to share, please do so. What’s worked for you? Any horror stories? I want to hear all about it. I don’t know why I find seafood so intimidating. It might have something to do with an upbringing heavy on the fish sticks and not much else in the under-the-sea department. I didn’t try lobster until after high school, thought sushi was disgusting until age 21 and didn’t have my first mussels until after college. I’ve spent the past few years making up for lost time in a sense, and have challenged myself to not only eat different fish, but to learn how to prepare it at home. I even have a fish guy — I’m on the Little Fish Company’s weekly e-mail list, and enjoy picking up my orders from the Sunday morning farmers market in Sacramento. 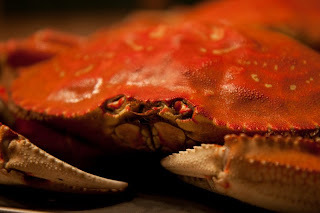 I’ve tackled scallops, salmon, mahi mahi, albacore and halibut cheeks (absolutely delicious), but it wasn’t until this past weekend that I came home from the market with a bag full of Dungeness crab. Two of these mean-looking sea creatures, each weighing at least two pounds, yielded enough meat for two meals. They were already cooked, but Chris and I still had to tear them apart and remove the meat. Quite the messy experience, but not a big deal. Sunday night’s dinner was simple, I just sautéed some of the meat with a pat of butter and some garlic salt, and served it with some herb-and-butter pasta. 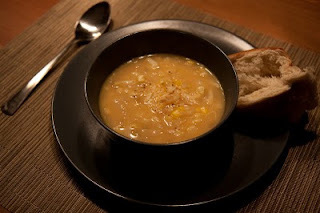 Monday night I crafted a flavorful chowder using the rest of the crab meat, diced potatoes, corn and some fantastic two-year sharp aged cheddar from Renard’s Cheese, straight out of Door County, Wisconsin. My attempt at crab chowder had some heat to it thanks to the cayenne, but I think it complemented the sweet flavors of the corn and the crab meat, and the cheese and potatoes gave it a good stick-to-the-ribs factor. Sautee onions over medium heat in a large pot for a couple minutes, stirring frequently, until onions are soft. Add broth and potatoes to pot and bring to a boil. Continue to boil potatoes until cooked — it took about 10 minutes for me to get them to a point where they were cooked, but not mushy. Turn heat to low, and stir in milk, cayenne, crab meat and corn. Allow soup to simmer for a few minutes. Add grated cheese and stir until the cheese has melted into the soup. Remove from heat and serve. Those adorable little lemons I discovered on my doorstep the other day have found themselves the stars of a fresh batch of cookies. I’ve kept the following recipe in my files for years now, and figured the neighborly gift of nearly a dozen lemons was the perfect excuse to finally test the recipe. 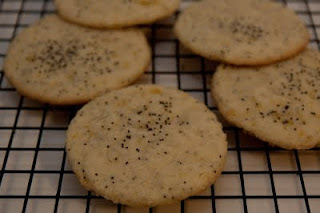 These delicate cookies are packed with fresh, tangy flavor, and the poppy seeds add a nice little crunch. They taste great with a glass of milk, and I think they’d pair well with a mug of tea on a chilly December day. 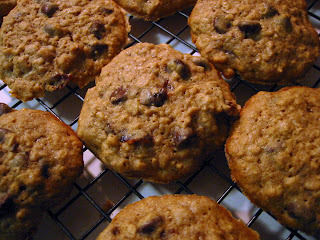 I think I'll try coconut instead of poppy seeds the next time I make these cookies, just for fun. A side note: While I believe in giving credit where credit is due, I’m not quite sure where this recipe came from. I tend to collect recipes printed on the pages of various magazines, so this could be Real Simple or perhaps Martha Stewart Living? Bring lemon juice to a simmer in a small saucepan over medium heat. Once reduced by half, add one stick (1/4 cup) butter, stirring until melted. Cream remaining butter and 1 cup sugar in a bowl of an electric mixer (use paddle attachment). Add egg and lemon butter, mixing until pale, about 3 minutes. Add vanilla extract and 2 teaspoons lemon zest. Mix in flour mixture and poppy seeds. Stir together the remaining sugar and lemon zest—I did this in a glass pie dish. Roll spoonfuls of dough into balls. Roll balls in sugar mixture and place them on a cookie sheet 1 ½ to 2 inches apart. Gently press each ball with the flat bottom of a glass—dipping the bottom of the sugar mixture helps—and sprinkle with additional poppy seeds. Bake cookies 10-11 minutes, until they’re just starting to brown around the bottom edges. Remove from oven, and let sit on cookie sheet 1-2 minutes before transferring to cooling racks. 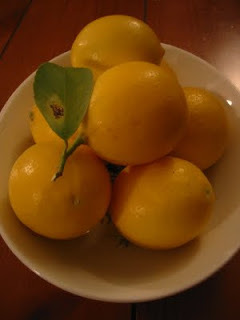 When a neighbor gives you lemons, what exactly do you do with them? The citrus fairy left a present on my doorstep. I got home after work yesterday to find a bunch of little, yellow lemons, curiously placed on the ground outside of the front door. Carmen, the little old lady across the street, brings me tomatoes every once in a while — I was the recipient of at least one egg carton crammed with a dozen roma tomatoes this summer — so I wasn’t too wary of the mystery fruit. But, come to find out, it’s her next-door neighbor, Patrick, who actually supplied the citrus. Mystery solved, but now I’ve got nine medium –size lemons to put to good use. Any ideas? Until I come up with something, I’ve at least got a pretty centerpiece for the coffee table. December’s officially here, and holiday madness is about to kick into overdrive. Trees are strapped to cars, lights are stapled to houses … seems like the perfect time to do some baking! I’ve always liked the chewy nature of oatmeal cookies, but much prefer chocolate chips to raisins. I also had some dried cherries in the cabinet, so I decided to amp up my oatmeal cookies just a little more. Oatmeal cookies with gooey chocolate chips are always a treat, and the cherries add an extra zip that raisins might not provide. That, and they seem just a bit more festive than some silly ol’ dried out grapes. Place oven racks in upper third of oven and preheat to 350 degrees. Combine butter, brown sugar and vanilla in large bowl, beating with electric mixer until fluffy before adding eggs, beating to mix thoroughly. Add flour, oats, baking powder, nutmeg, cinnamon and salt, mixing on low speed until blended. Add chocolate chips and dried cherries until incorporated. 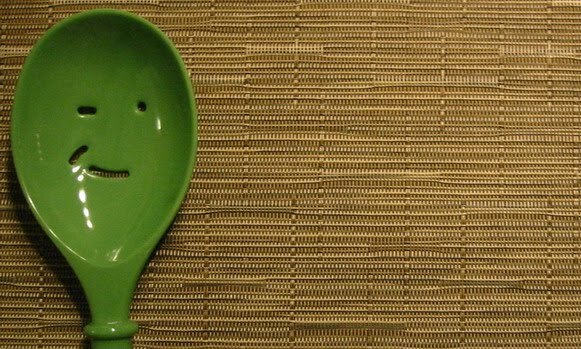 Drop batter by the tablespoon about 1-1½ inches apart on greased cookie sheets. Bake for 12-14 minutes or until cookies appear golden brown but are still soft. Remove cookie sheets from oven, letting cookies stand for 2-3 minutes before moving them to cooking racks.